Playing A-K after the Flop - Don't Lose Your House, Wife and Car! Playing A-K after the Flop: Don’t Lose Your House, Wife and Car! So it’s down to your favourite day of the week – Friday poker night. The first part of the night goes fairly well, but you still haven’t hit the big pot that you have been hoping for. Then, like a gift from above, your first two (pre-flop) cards are an A -K . Just what you’ve been waiting for! What should your first move be? 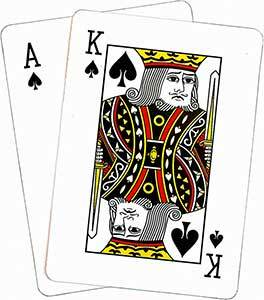 A Typical Ace-King Hand – Sound Familiar? Well your holding one of the stronger hands in poker, so your going to raise it up and not only narrow the field of opponents down but also build some value into the pot. A number of your opponents immediately fold but three opponents call and come along for the ride. The flop cards are laid down: J , 10 , and 3 . Well the flop has missed your powerful Ace-King but you have added a very powerful draw with a spade flush draw, a straight flush draw and a gutshot straight draw. You were the aggressor before the flop and so you come out betting after the flop with a pot sized bet trying to show your opponent that you are still strong and that you mean business. Two of your opponents have seen enough and they pack their bags and get out of the hand but suddenly your third opponent comes back over the top of you with a raise. Your now faced with a tough decision and you get down to crunching the numbers to see how much money you need to put in to call the raise and what odds you have of actually hitting your draw. Eventually you decide to call the raise. The turn card is the 8 which completely misses your draw and you are first to act. Now you have a really tough decision to make. Your opponent has shown some serious strength on the flop which gives a strong indication that he has already made his hand and wants to protect it against the flush draw. The flush draw hasn’t come and it is very likely that he is going to try and protect it again whether you bet out or not. So you decide to check and your opponent moves all-in, which forces you away from the hand and you fold. The above is just an example of how difficult Ace-King can be to play after the flop. It looks pretty and is a very strong starting hand, but at the end of the day it is a drawing hand. If you fail to connect with the flop, turn or river then all you have is Ace high. So How Should I Play Ace King? The key to playing Ace-King is to recognize what it really is and play it like a drawing hand. Yes be aggressive with it before the flop, and yes by all means take a stab at a continuation bet if you’re playing against the right players that you think will fold even if you don’t connect on the flop, but if you are shown signs of resistance and you are confident that your opponent has you beat, then get the hell out of there if you haven’t got the correct odds to continue. At this point, it is important for you to evaluate what type of players you are up against. In every situation it is imperative that you keep an eye on what actions were taken by your opponents in previous hands so that when you come to face them you can use that information to take the best actions against them. If you find yourself up against a very tight player, and he has already called your raise pre-flop and then calls or raises your continuation bet then you can be fairly sure that he has you beat. Against a more loose player, he may well come along for the ride without much of a hand, and your strong ace high or strong draw could still hold you in good shape. But Ace-King really is a hand that should be played aggressively before the flop and then cautiously after the flop. I always remember a quote I heard from Scotty Nguyen while talking to another player who had just lost a big portion of his stack when he overplayed Ace-King and ran into an opponent who had him well beat. So then how do you go about playing Ace-King after the flop? Well whether you connect with the flop or not, you are probably going to want to put a bet out after the flop to try and find out where you are with your opponents. You may well take the pot down there and then, or one or more of your opponents may call or raise your bet. If you get callers or are raised then its time to hit the think tank and try and put your opponent on a hand. Look at the board and try and work out if you think they have already hit a hand, or whether they could have been calling the bet on a draw. If they are raising, then look at the board and see if there are any kinds of draws showing on the board that your opponent may be trying to protect against with a hand such a top pair or stronger. If your opponent is a good player, then they may well have already put you on a hand like A-K and recognized your continuation bet and be re-raising you to take you off the hand. Unfortunately there is no set strategy for playing Ace-King after the flop, it is heavily dependent on the type of players you are up against, the cards that have come down on the flop and your table image. 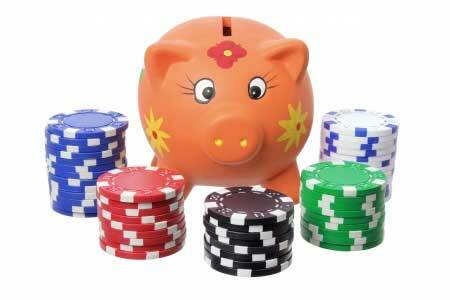 Before automatically making a continuation bet after the flop you should consider the flop. If you get a combination of cards that would most likely not benefit most of your opponents, then this is a good time to make a continuation bet and possibly take the pot down there and then. If you get a flop that looks dangerous and may have hit the sort of cards that you think your opponents would call a pre-flop raise with then just use common sense and don’t go betting your life on your A-K. If the flop cards are laid down and are in your favour, bet. If they aren’t then the better option may be to check. There is one thing you should keep in mind, if another player decides to bet into you on the flop, don’t make the mistake of re-raising! Often times in this situation you will end up getting beat out with a better hand and more often than not an opponent who bets out here will have some type of hand. In conclusion, it all comes down to having a sensible post flop strategy. It is a wise idea to evaluate the players you are up against and the type of cards in the flop when you see the AK in your pre-flop cards. You also need to pay close attention to the moves made by your opponents. If you make the wrong move, it could cost you a pretty penny.